Going to relatives or friends for Thanksgiving and don’t know what to bring along to keep your little ones occupied and entertained? Why not consider buying a copy of this counting themed board book, part of the Charlesbridge’s First Celebrations series for the youngest readers in your family? With its vibrant colored turkey cover, this new book introduces the first Thanksgiving and one ear of corn going all the way up to six multi-hued leaves falling from a tree and lots of scrumptious food in between. 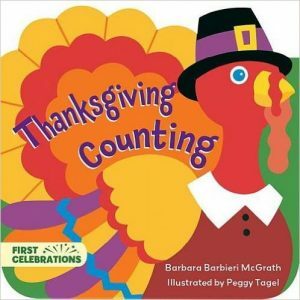 Thanksgiving Counting is a great way to get your children to observe all the decorations and food around the dinner table while learning to count all the wonderful things that make this holiday so enjoyable. 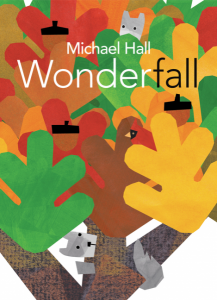 For Hall fans and those who also appreciate the art of Eric Carle and Lois Ehlert, Wonderfall is sure to delight. As the jacketflap says, “In this book you will discover 1 colorful tree, 2 scurrying squirrels, and 15 blended words created to celebrate the wonder of fall!” So much goes on around this one majestic oak tree. In 15 brief poems that tell the story of the people and animals that live and work near it, we see what an important role this tree plays as autumn turns into winter. Peacefall, Plentifall, Playfall, Frightfall, Thankfall, and Watchfall, are just a few of Hall’s wordplay topics that culminate in Snowfall. The stories move from acorns dropping with a plink, plunk, plop to the magic of fall’s magnificent colors. The tree is there to welcome trick-or-treaters, witness animals enjoying nature’s bounty and provide piles of leaves in which children frolick, and branches in which squirrels chase. A bonus for readers is the five pages of back matter containing great information about the tree, the animals that find shelter in it and get nourishment from its acorns. I’ll weigh in here with one more blended word that happens to be my reaction to reading this charming new picture book – Joyfall! Coloring books are so popular right now and with the hectic holiday season upon us, there’s no better time to find a few quiet moments with your kids to decompress. Coloring helps foster creativity and mindfulness, and most of all, it’s calming. Adults and children alike will find the designs and quotes that Ingram has provided to be perfectly suited for Thanksgiving. 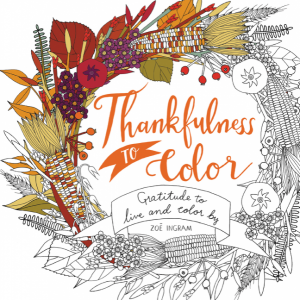 On the last page of Thankfulness to Color is a list of these quotes including Henry David Thoreau’s “I am grateful for what I am and have,” all of which have been woven into the plethora of beautiful patterns. Keep this book to enjoy with the family or give as a gift to your holiday hostess. Looking for a way to keep the peace during holiday gatherings? Or do you need a way to get those eternally bored teens to put down the phone and interact with family members? Try gathering those cousins around a table and color together! 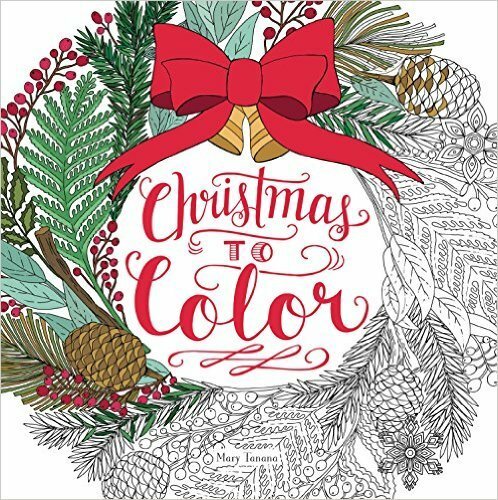 Mary Tanana’s Christmas to Color provides ultra-attractive, over-sized pages of beautiful Christmas scenes to tempt even the grouchiest Grinches of the family! Snowflakes, wreaths, ornaments in detail, and so many other festive designs are sure to add amusement to any family gathering. 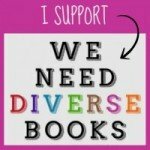 Tanana cleverly draws some designs that can be cut out and placed in outlined areas on facing pages. “Trim” an intricately decorated tree with colored pens or pencils, then place it in the blank center of a background of poinsettias and mistletoe. Or have the relatives color any of the pages of sleds or stockings, animals and stars and so much more, to create a collage of everyone’s work. 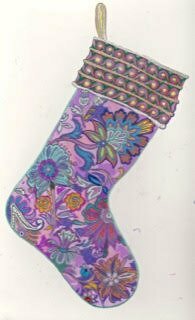 Bright and cheery stocking colored by Juli Barry from artwork in Christimas to Color by Mary Tanana, HarperCollins, ©2015. 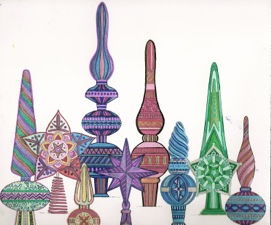 Twinkling toppers colored by Juli Barry from artwork in Christimas to Color by Mary Tanana, HarperCollins, ©2015. Coloring books are all the rage this year and they come in every size and theme. 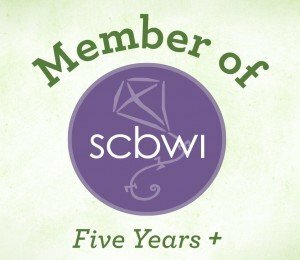 Lizzie Preston and Jane Ryder-Gray, Jess Bradley, and Felicity French all illustrate a new, smaller (6” X 6”) coloring book series appropriately entitled I Heart Coloring … These make great stocking stuffers and provide fun distractions during those holiday trips in planes, trains, and autos. 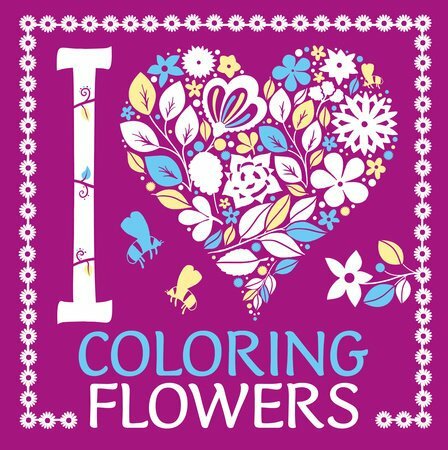 Specifically, I Heart Coloring Flowers with artwork by Preston and Ryder-Gray includes intricate floral patterns and challenging motifs as well as lighter fare for those just starting out. You can mat and frame your completed pages and give them as presents, or cut out particular flowers and add them to hand-made cards. Use now or save for Valentine’s Day or Easter. 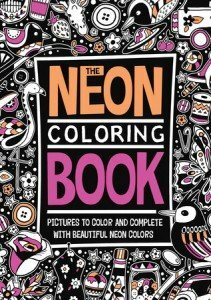 Check out the bold, over-sized The Neon Coloring Book with its hints of neon orange and pink adorning pages of animals, skateboards (!!) and other funky objects. Black or neon-colored backgrounds radiate other pages of delights to color. So buy a pack or two of neon markers and join in the fun! Coloring provides both a quiet way to interact with loved ones and a creative break from all the work and stress of the holidays. 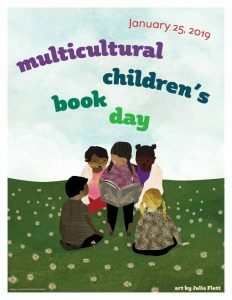 And Price Stern Sloan has a tempting array of coloring books sure to brighten everyone’s day!